Here's proof that if the five despicable teens who taunted and filmed drowning man were cops, they would not face charges. This week, headlines across the country lambasted the Florida teenagers for filming and taunting a disabled man as he drowned in a lake. On Friday, the Cocoa Police Department (CPD), in conjunction with the Florida State Attorney’s Office, announced they are pursuing criminal charges against the five teens. What those teens did was repugnant, disgusting, and an insult to all that is good. Their actions, or rather inactions, caused the suffering and death of an innocent life and they will have to live with that for the rest of their lives. That being said, however, if those despicable teens had been cops, they would not have been charged at all. As the Free Thought Project has reported on numerous occasions, police officers can and will watch adults and children alike drown and not face charges. Below are just a few examples of police officers acting just like these teens, some of them even laughing as people drown right in front of them. The most recent and horrifically tragic case of police officers failing to act and save a drowning victim comes from St. Paul Park, Minnesota. Kendrick Jordan, Jr., 5, drowned earlier this month as police and EMTs stood on the shore of Carver lake and did nothing. In another tragic incident, Trooper Anthony Piercy handcuffed Brandon Ellingson, 20, and incorrectly placed a life jacket over him. As he drove off in his police boat, he hit a wake, causing Ellingson to be tossed out of the boat. For handcuffing a college student, negligently casting him into a lake, and watching as he drowned, Trooper Piercy pleaded guilty to a simple boating violation. Over the memorial day weekend last year, a 20-year-old lifeguard had an apparent mental breakdown while on the job at the Riverside Apartments in Alexandria, Virginia. When police arrived to help the man, they stood around and laughed as he drowned. The incident was captured on cellphone footage. The 20-year-old sank to the bottom and was underwater for nearly three minutes as cops are seen on video joking. None of those officers were charged. Dash cam footage, released last year revealed that a Florida sheriff lied when he falsely claimed that his deputies took off their gun belts and attempted to save three drowning teenage girls. 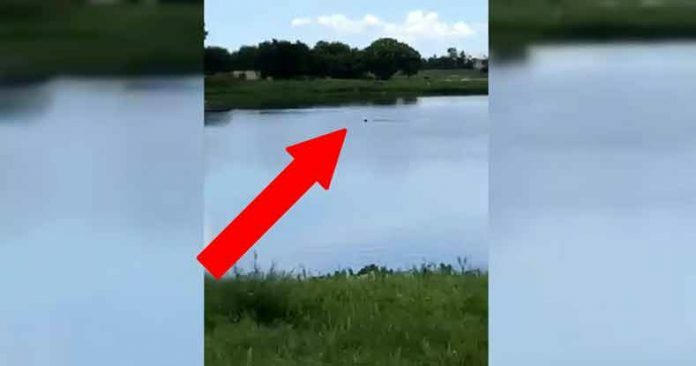 Instead of attempting to rescue the dying teens, the deputies can be seen on video standing beside the pond while listening to the girls’ final screams. In that case, the deputies were not charged. Instead, they were hailed as heroes. Not only have police been captured on video failing to help drowning victims, they have also been reported to threaten others with arrest for trying to save people. In 2014, 64-year-old Constance Manzanares drowned after she became trapped in her car in a drainage canal, in Northeast El Paso, Texas. When police arrived on the scene, there were a number of young men in the water attempting to save the victim and rescue her from the car. However, witnesses say that police threatened the young men with arrest and chased them away from the area, and then failed to make a rescue attempt of their own, allowing the woman to drown. According to an anonymous witness who was interviewed by local KFOX14, the woman may be alive today if the police had never shown up in the first place. “They went and tried to help this lady, they tried to help her, but the police said they can’t, they were yelling and everything, I don’t wanna say nothing bad about them, I know they give good service here and everything, but I said ‘Oh, my God….They hit the window on the driver’s side, and she tried to get out but there’s a fence right there, and she couldn’t get out. So she had all that weight with her and all the water inside. The men got scared, they didn’t want to leave, they were mad, so they got scared, people were yelling so they had to leave before they got arrested,” the witness said. The officers mentioned above all failed to step in and save the lives of drowning victims. Why they acted in such a manner is a mystery. However, it is important to point out that not all police officers act this way and when they do actually save lives, they are praised. Officer Aaron Bulmer was out looking for suspects near the Central Park Community Center on April 30 this year, when he noticed a little boy walking dangerously close to the pond. All of the sudden the boy fell into the water and began bobbing up and down — unable to swim. Bulmer then jumped in, grabbed the little boy and pulled him to safety. The entire dramatic scene was captured on the officer’s body camera.